The above snapshot should very well explain why I personally despise our local stock counters. I'm actually quite furious about this kind of FUNKY CLOSING(s) for KLCI. I haven't even show the charts on CYBERT, GPRO, E&O....etc. Their market capital can go doubled, then halves, all within a matter of a few weeks, if not days. One friend commented on my previous post, saying that he dislikes Futures, & is now enjoying charting on good fundamental stocks in KLCI. Well, only by manipulating certain GOOD FUNDAMENTAL STOCKS, will our beloved index rocket up within the last miute of trading like that. Buy a good company with potential GROWTH PROSPECT, spare 10% of your monthly income to invest in it for the next 10-20 years. Other than that, there's hardly any chance for retailers like us, without any UNFAIR ADVANTAGE of getting FASTER & MORE 'ACCURATE' INFO, to make money from KLCI stocks. For those faithful local stock investors out there, follow the Buffet style. Otherwise, sorry for being blunt, but I really wish you all EXTRAORDINARY LUCK to profit from this manipulative market. Just a post to refute those noises that bothers me recently. Just so we can BE AWARE of / IDENTIFY 'funky happenings' in the market, & be able to give ourselves MORE OPTIONS to make a more INFORMED DECISIONS. Yep, I agree with what you said. For the local counters, focus on steady companies for long term investment. U have checked out Conrad's course preview? I think it helped me a lot in understanding how one instrument reacts with another, how supply/demand of commodities affects the whole market. How a REAL trader works his trade, & how he approach the market & make a living out of it. 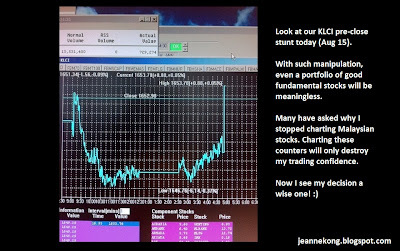 I attended many courses, but only after his coaching I realized becoming a full-time trader is not a dream, it can be practiced as any other Profession, just on a more flexible time frame, & freedom to not answer to anybody. Yup..I attended Wealth Expo 2012 last sunday and listened to his course preview..definetely his talk is great and attract me..
Anyway,to be honest, i did sign up for some course before but it don't really help..it make me a bit lost confidence.. But I do feel Conrad is good, just the previous not-so-good experiences make me hesitate..anyway, i think will sign up for the course since you recommed him as well..haha, i don't know why but i do trust you even though i just one of your reader..maybe because i could feel something "real" from your blog? I think to be a trader it need not to win all the trade, but it has to be real and trustable..
Last check the Oct workshop is FULLY BOOKED!! Hope you can still fit it! What will u do if you're The Fed?